Expectant parents try to pick out names before their baby's due date. Astronomers are doing the same thing. They're looking for suggestions for planetary features they expect to discover when a spacecraft flies past Pluto in July. 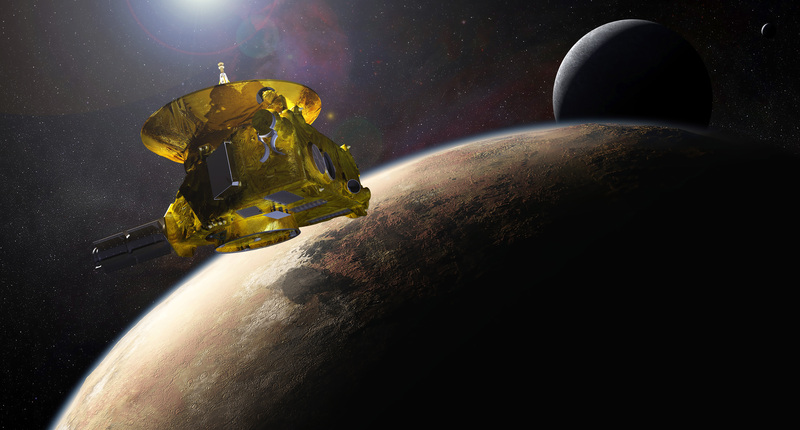 NASA's New Horizons<https://lnks.gd/l/eyJhbGciOiJIUzI1NiJ9.eyJlbWFpbCI6Imdlb3JnZS5mLmdhYnJpZWxsZUBuYXNhLmdvdiIsImJ1bGxldGluX2xpbmtfaWQiOiIxMDAiLCJzdWJzY3JpYmVyX2lkIjoiMTM4NDEyOTg1IiwibGlua19pZCI6IjI3MTYzOTQ4IiwidXJpIjoiYnAyOmRpZ2VzdCIsInVybCI6Imh0dHA6Ly93d3cubmFzYS5nb3YvbWlzc2lvbl9wYWdlcy9uZXdob3Jpem9ucy9tYWluL2luZGV4Lmh0bWwiLCJidWxsZXRpbl9pZCI6IjIwMTUwNDE4LjQ0MjQwOTUxIn0.5lRMf_IPNv8E5U_aMXzfyVNZX09yc27QuDys2OL7ieU> probe has been traveling nine years and more than three billion miles to the outer edges of our solar system. When it reaches Pluto, on July 14, it will send back the first-ever close-up images of the dwarf planet and its moons. You can submit names<https://lnks.gd/l/eyJhbGciOiJIUzI1NiJ9.eyJlbWFpbCI6Imdlb3JnZS5mLmdhYnJpZWxsZUBuYXNhLmdvdiIsImJ1bGxldGluX2xpbmtfaWQiOiIxMDEiLCJzdWJzY3JpYmVyX2lkIjoiMTM4NDEyOTg1IiwibGlua19pZCI6IjI3MTYzOTUwIiwidXJpIjoiYnAyOmRpZ2VzdCIsInVybCI6Imh0dHA6Ly93d3cub3VycGx1dG8ub3JnL25vbWluYXRlMiIsImJ1bGxldGluX2lkIjoiMjAxNTA0MTguNDQyNDA5NTEifQ.Y9kGwNx8cvD8yR8BaR9vj7kT-IGPtv8bLwv0HOPMdMs> for as-yet-undiscovered geological features on Pluto and its largest moon, Charon. Names must fit into themes<https://lnks.gd/l/eyJhbGciOiJIUzI1NiJ9.eyJlbWFpbCI6Imdlb3JnZS5mLmdhYnJpZWxsZUBuYXNhLmdvdiIsImJ1bGxldGluX2xpbmtfaWQiOiIxMDIiLCJzdWJzY3JpYmVyX2lkIjoiMTM4NDEyOTg1IiwibGlua19pZCI6IjI3MTYzOTUyIiwidXJpIjoiYnAyOmRpZ2VzdCIsInVybCI6Imh0dHA6Ly93d3cuaWF1Lm9yZy9wdWJsaWMvdGhlbWVzL25hbWluZy8jZHdhcmZwbGFuZXRzIiwiYnVsbGV0aW5faWQiOiIyMDE1MDQxOC40NDI0MDk1MSJ9.txnRHtgmLC5NSXC0dG8qHD6JVjh3FJAOOc9vXZiCAZY> about mythology or exploration. You can also check out suggested names and vote<https://lnks.gd/l/eyJhbGciOiJIUzI1NiJ9.eyJlbWFpbCI6Imdlb3JnZS5mLmdhYnJpZWxsZUBuYXNhLmdvdiIsImJ1bGxldGluX2xpbmtfaWQiOiIxMDMiLCJzdWJzY3JpYmVyX2lkIjoiMTM4NDEyOTg1IiwibGlua19pZCI6IjI3MTYzOTU0IiwidXJpIjoiYnAyOmRpZ2VzdCIsInVybCI6Imh0dHA6Ly93d3cub3VycGx1dG8ub3JnL3ZvdGUiLCJidWxsZXRpbl9pZCI6IjIwMTUwNDE4LjQ0MjQwOTUxIn0.DYvkSsI2dJmutGPzTZFWbdb3YmPniOXpKrwzXZ1Rga8> for your favorites. But don't wait. Deadline for both is next Friday, April 24. For more information on these and other stories, visit: http://www.nasa.gov/twan This Week at NASA" and other NASA features are available at http://www.nasa.gov<http://www.nasa.gov/> under NASA Multimedia,  http://www.youtube.com/nasatelevision and iTunes. NASA's Hubble Space Telescope is turning 25 this year. The observatory has transformed our understanding of our solar system and beyond, and helped us find our place among the stars. 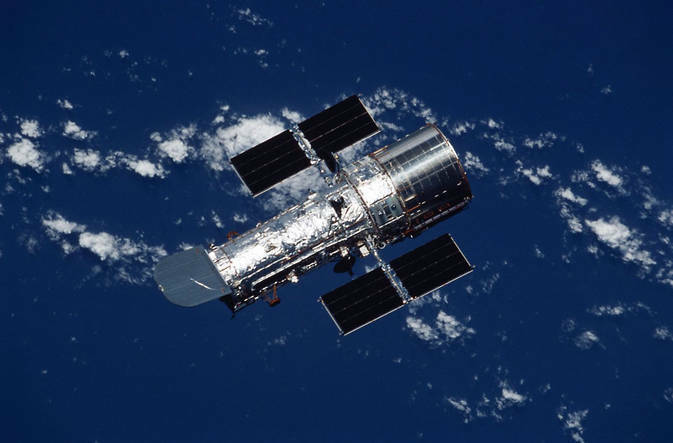 Hubble, the world's first space telescope, was launched on April 24, 1990 aboard the space shuttle Discovery. In its quarter-century in orbit, the observatory has transformed our understanding of our solar system and beyond, and helped us find our place among the stars. *       Thursday, April 23 (9 to 9:45 a.m.) -- Newseum, 555 Pennsylvania Ave. NW, Washington -- NASA will unveil the official Hubble 25th anniversary image at this public event, with remarks by NASA Administrator Charlie Bolden, Associate Administrator for the Science Mission Directorate John Grunsfeld, Hubble Senior Project Scientist Jennifer Wiseman, and Space Telescope Science Institute Interim Director Kathryn Flanagan. *       Friday, April 24 (8 to 9 p.m.) - Smithsonian's National Air and Space Museum, 600 Independence Ave. SW, Washington -- Astronauts, scientists, engineers, technicians, educators, and staff who have contributed to Hubble's success will be honored at a closed ceremony, followed by talks from prominent officials whose significant contribution to space science have made Hubble possible. For media interviews, contact Dwayne Brown at 202-358-1726, or dwayne.c.brown at nasa.gov<mailto:dwayne.c.brown at nasa.gov>.